We’re sold out! Thank you everyone for purchasing tickets. 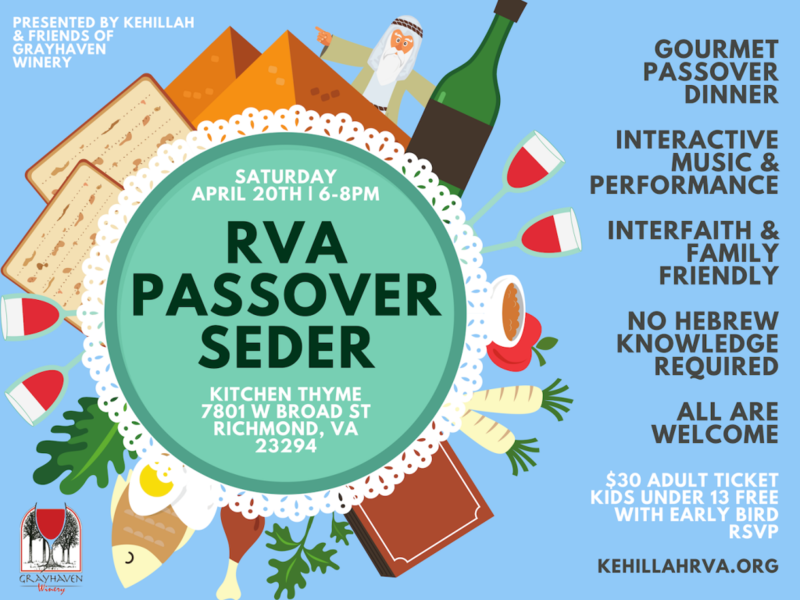 Seder lead by community rabbi Patrick Beaulier and includes music by Robin Rio and company, maggid (Exodus storytelling) by local Richmond actors, and a delicious traditional seder dinner by James Beard nominated chef Henry Preston. Plus, there’s a chocolate fountain and dessert by pastry chef Kristin Preston!!! This event is open to everyone regardless of religious affiliation or practice. No Hebrew experience is needed and kids will have a blast with our seder activities provided by the Kehillah Family School. We love our interfaith friends and family and encourage all to come. $30 per adult ticket including seder meal and wine sponsored by Friends of Grayhaven Winery. Children free with early bird RSVP. Meal includes meat and vegan options. Please reach out to us with any special dietary restrictions, kosher questions or needs. In conjunction with Southminster Presbyterian Church, hosting a 30 Minute Seder to teach what Passover means for the Jewish people, to give a beginners lesson on what a Passover seder is like and building interfaith bridges in Chesterfield. A Passover-themed brunch to follow after. We cannot make these events possible without financial support. Giving a monthly donation, no matter how the size, helps us continue all our hard work. You can give a donation safely and securely online here. With Kehillah, Jewish life is everywhere!